Rudy Giuliani, President Trump&apos;s personal attorney, in Washington in May 2018. WASHINGTON — President Trump’s personal lawyer Rudy Giuliani backtracked Thursday from a surprising assertion he had made a night earlier that left open the possibility that Trump campaign aides might have coordinated with Russia in its election interference in 2016. Giuliani was seeking to clarify an interview Wednesday night in which he stopped short of defending Trump campaign aides, drawing speculation that he might have inside knowledge of possible coordination with Russia. “I never said there was no collusion between the campaign or between people in the campaign,” he told CNN. He added, “I said the president of the United States. There is not a single bit of evidence the president of the United States committed the only crime you could commit here, conspired with the Russians to hack” the Democratic National Committee. Giuliani’s backpedaling was the latest in a series of conflicting comments he has made about the investigation by the special counsel, Robert Mueller. The evolution of his statements have suggested shifts in the president’s defense strategy, often following developments in the investigations. On Tuesday, prosecutors for the special counsel filed a 200-page, mostly redacted court document related to the case against Trump’s one-time campaign chairman, Paul Manafort. Among the little information that was not blacked out were details about his relationship with a Russian whom prosecutors have said has ties to Russian intelligence. The special counsel’s document was in response to a recent filing by Manafort’s legal team, which inadvertently disclosed that Manafort had provided his Russian associate with US polling data — details that offer the clearest example yet that the Trump campaign may have tried to coordinate with Russia before the 2016 election. Giuliani has previously denied that there was coordination by Trump campaign aides. The president agreed with him in a subsequent Twitter post, and added that Hillary Clinton, his former Democratic rival, was the one who was doing the colluding. Trump has long maintained that his campaign never aided Russia’s meddling, even as the special counsel inquiry has revealed communications between Russians and some Trump campaign aides. While the word “collusion” has no defined legal meaning, in plain English, it means working together, typically in secret, to do something illicit. And whether Trump knew during the campaign of any Russian attempts to disrupt the election has been a central question in the investigation that started in the summer of 2016. Trump’s former personal lawyer, Michael D. Cohen, was prepared to tell prosecutors that Trump knew about a June 2016 meeting in Trump Tower that was arranged so campaign officials could get damaging information on Clinton from Russians. The president and his lawyers have denied that Trump had any knowledge of the meeting until July 2017, when The New York Times was preparing to publish an article about it. At the time, when the White House was scrambling to prepare a statement about the Trump Tower meeting in response to The Times’ article, Trump met with President Vladimir Putin for more than two hours in Hamburg, Germany, where they were attending an economic summit meeting. Later that day, Trump sought out the Russian leader during a summit meeting dinner. Only interpreters, the secretary of state at the time, Rex W. Tillerson, and Russia’s foreign minister, Sergey V. Lavrov, were in the first meeting with Trump and Putin. Afterward, Trump took his interpreter’s notes and told the interpreter not to tell anyone what was discussed. No US officials were present for the second encounter during the dinner. The following day, while Trump traveled back to Washington on Air Force One, he called a Times reporter to say that the Russians had been falsely accused by US intelligence agencies of hacking during the campaign. The president also huddled with his aides to draft a statement in response to the article about the Trump Tower meeting and personally dictated a misleading account that the meeting was about Russian adoptions. He did not admit that the meeting was arranged to address Russia’s offer to help his campaign, which emails later obtained by The Times confirmed. Earlier this week, senators questioned Trump’s nominee to be the next attorney general, William P. Barr, about how the Justice Department would handle a hypothetical report from Mueller. That there will be such a report at the end of the special counsel’s investigation is just speculation, but Barr was pressed on whether he would share the report with Congress and the public and whether what he shared would be an altered version of the original. Barr assured senators Tuesday that the White House would not be correcting the report before releasing it. 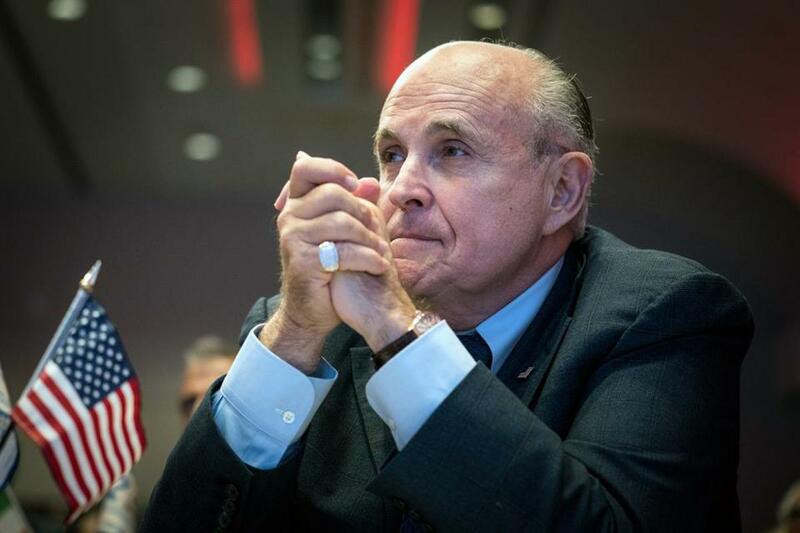 And Giuliani said his comments Wednesday on CNN had not been an effort to address a possible Mueller report detailing evidence of cooperation between Trump campaign aides and Russia.